Discussion in 'Lake Mountain' started by teckel, May 14, 2013. Got to Marysville about 8am and decided not to try it as about that time I got a report from one of the ski school staff who had just done a survey of the trails. Apparently they were soggy and patchy (the temp was borderline last night). Now I get home and the cams show a fresh, complete surface from echo flat onwards, yet the description says poor. Took my nephew on his maiden &quot;snow trip&quot; to the mountain today. Bit of tobogganing and snow play. Conditions good for a first timer. Village toboggan run was good until the crowds arrived. Choppy by mid arvo, even worse over at the Koala run (from memory). All in all well worth the trip. Hopefully got another future snow addicted kid out of it. Skiers today reported fairly good skiing from Echo Flat, and patchy but doable skiing below that. What a shame you never got there. I'd be giving him a piece of your mind! Saw one weather report when it was still dark. The next one, the dogs were barking so loudly for their morning toast with vegemite, that I couldn't make it to the TV to see or hear in time. Left for work 5 mins after that. Everyone without exception returning gear today pronounced the day &quot;perfect&quot;. When they arrived it was still snowing on top of the 16cm fresh snow overnight. When they left it was sunny. With lots of soft fluffy snow everywhere. Sounds like heaven up there. Were the snowfalls today anything significant or just a dusting? Going by the car park web cam history, I'd say just a dusting. Slightly off topic, but does anyone know what they're doing up near Woolybutt? There you go , forums don't let first timers put up images for some reason. That pic looks to me like the path between the village and koala creek creek toboggan runs, which would explain the snow pipe from the big white snowmaker. 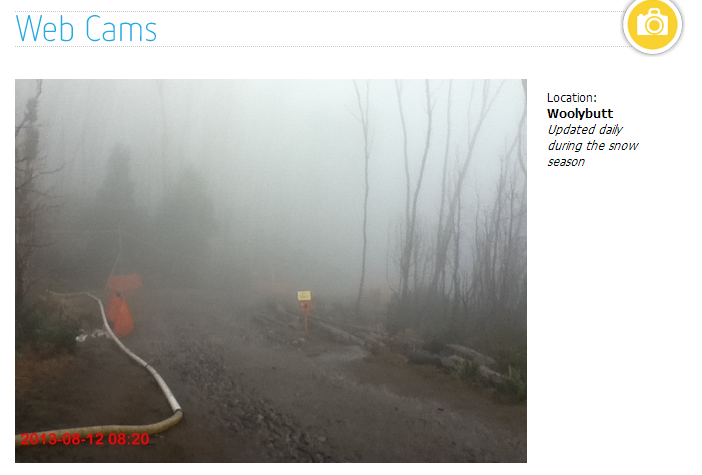 The cam photographer never went up on the trails yesterday, hence the report vid was taken next to the visitor centre. They just filled the cam slots with other random areas instead. I think you may be right carrotdude. I saw the pic and was wondering much the same thing. I wouldn't hold your breath Tele. They would need fan guns, a lot of power (which they don't have), a lot of water and other infrastructure. All requires a lot of $$, permits etc. There's a rumour going around that they're trying to get $2 million of funding from somewhere to get some guns for the trail head/lower echo flat area. Whether or not that actually ends up happening we'll just have to wait and see. I think the funding could happen one day, Isn't Ben Lomond asking for some money to help them secure more reliable seasons with snow making equipment? I think with the much dreaded G****** W******* coming into effect (if it does, I'm not saying it will) in the coming years, which may effect the lower resorts first, They will value snow making equipment quite highly. I certainly hope you're right. Never before have we needed it so badly. I'm in full agreement with you, actually My reading of the weather charts says just the same thing. But this season has been so full of disappointing weather outcomes that I'm starting to doubt the charts. Disregard the last report by me, I think there was a bit of a stuff up in the snow australia email report, they say 5cm natural yet there was nothing on the cams this morning???? On the brighter side it looks like theres been some good snow over the last few hours, any on ground reports from anyone? They've had the snow guns (the proper ones) going non-stop since the middle of the night so the freezing conditions must be ideal atm. I much prefer the snow to be under my skis rather than falling onto me. If I could I'd go wednesday, but I have to attend class (yes, I'm a student). Friday is more likely if I can get off. If the current predictions are correct than we should get a decent fall on Thursday too although maybe a sprinkle of rain on Saturday. Time for a sickie I reckon. At 7:50 this morning I phoned the mountain asking if chains were required to be carried today. &quot;No&quot; they said. I was incredulous. Consequently, I advised my customers in 2WD vehicles to carry chains, and I would refund the cost if they weren't used. At 3:25pm, the mountain phoned me to advise that all 2WD vehicles had to carry chains. A bit late, me thinks. What on earth were they thinking this morning? There is a conflict of interest involved, I think. If people are forced to stop at a ski hire at the bottom of the mountain to hire chains, those people are more likely to hire all their gear at the bottom of the mountain, and therefore the resort's ski hire loses custom. Imo, peoples' safety should be more important than profits. And yes, I know it's been a really bad year for the mountain. I'm not sure if this is because of the radar signals being less responsive at altitude or if it's the rain clouds being at or below the height of the mountain meaning that the rain/snow fall is largely below them. Given that the radar seems to work fine around Buller etc I'm guessing it's the latter. Nice to see LM is reporting 13cm of snow. It's a start (again)! I'm planning to head up tomorrow, will post report when I get back. On lake mountains video report they reported 20cm (maybe thats up high) still teriffic news, Hopefully were on our way to the 40-50cm forecast by mountain watch! How exiting is this! a 10-20cm base is just as exciting as a 1m base at hotham! There was some base left over on the upper trails when this system came through fortunately. You heading up during the week tele? wow I had no idea we had a base up high! I guess the summit at 1480m pays off sometimes. Hmmm not really unfortunately family event i've got to go to and more tafe so maybe over the weekend if its still good. I'll have to ski with you one day. Do you skate? Not yet, when I'm more cashed up and able to frequent Falls and Stirling then I can justify it. But for now while I'm mostly confined to LM and Baw Baw I have to stick with classical just to be able to ski at all since the conditions rarely seem good/smooth enough for skating. Are you a slowish skater? I'm pretty fast for the planks I'm on. Tomorrow I'm helping a mate of mine refresh his XC ability but that won't take long. And yes, it's amazing the difference 150m extra height makes. If only it was possible to lift a mountain. I started off with skate skis, which most people don't usually do. I sometimes have to bare the bad conditions with them but I also use Backcountry skis for tricky snow or steeper downhills. I am pretty slow at skating as I don't know how to use all the techniques properly yet. An instructor told me this story a long time ago. She was a newbie and learned on skaters and was invited by friends to tour Bogong. So she rocks up with heavy pack and skaters. And coped fine. No wonder she became an instructor. As always, the bottom line is that the skier makes the going, not the gear. haha, really? thats amazing doing bogong on skates. what I do like about them as you can get up a lot of speed on them compared to classic skis but they are incredibly hard to telemark on! Ah, yes, the 'sidecut' is in the wrong direction altogether! Yeah, I love skating on groomed trails. A good launch gives you metres of glide. But I hate having to reacclimatise to them after days on heavy metal. They feel like matchsticks at first. One of the best things in my repertoire with heavy metal is just plain kick and glide inc. double-pole single kick.